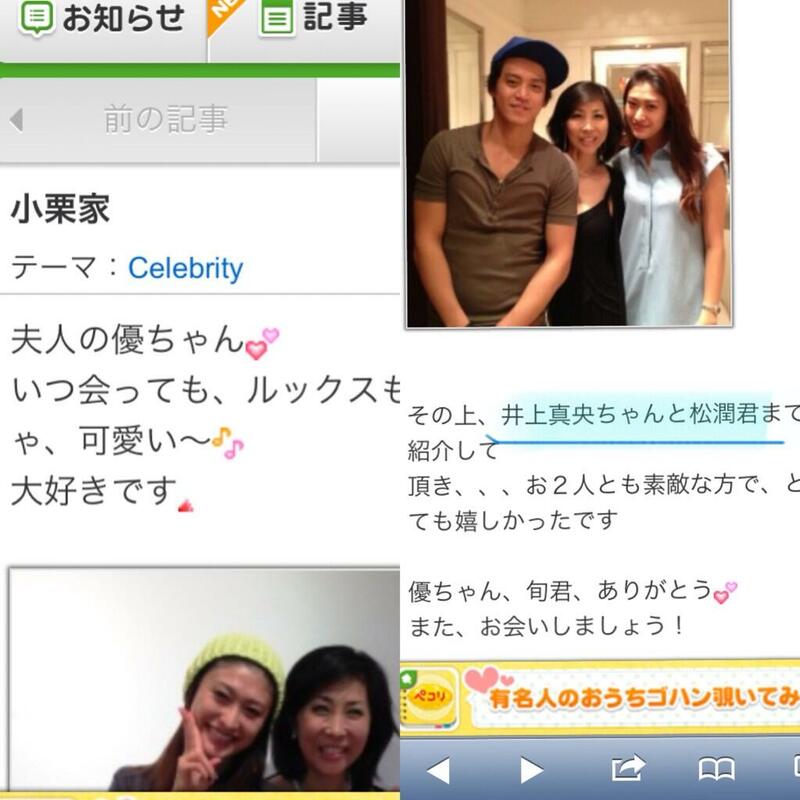 unleashthegeek: Maotsujun outed by a blog post? Maotsujun outed by a blog post? On the 12th of August, Kagaya Mari, a fashion consultant and Vice President of Ralph Lauren Japan Marketing & Communication PR posted an entry in her blog titled 'Oguri Residence'. Here's a translation. Rather than calling him cool, I'd say he's handsome! The blog post has since been deleted although you might still find a cache of it here. The tweet she posted about the entry is still up on her Twitter account. This is a snapshot of the cached blog entry. The post is also being circulated on Twitter. Coincidentally or not, on the morning of 12th August, Kansai's morning show 'Asanama Wide Ce Matin!' teased a headline scoop of next week's issue of 'Shukan Josei'. A super popular idol is getting married!! The title of the blog post 小栗家 can be read as Oguri's home or Oguri family. Many gossip websites have taken it as a gathering over at Shun's house with Kagaya Mari, Mao, Jun and his family members present. But some users in Japanese forums have pointed out that everything has been blown out of proportion as Kagaya has put up a few posts on the same day with other celebrities, suggesting that everyone had just met at some press event. The mother and elder sister mentioned can be taken to mean as Shun's family and hence the title of the blog post as Yamada Yu does not have a sister. The two photos she posted were also probably taken on different occasions as both her and Yamada were wearing different outfits. I think where they met is irrelevant though. 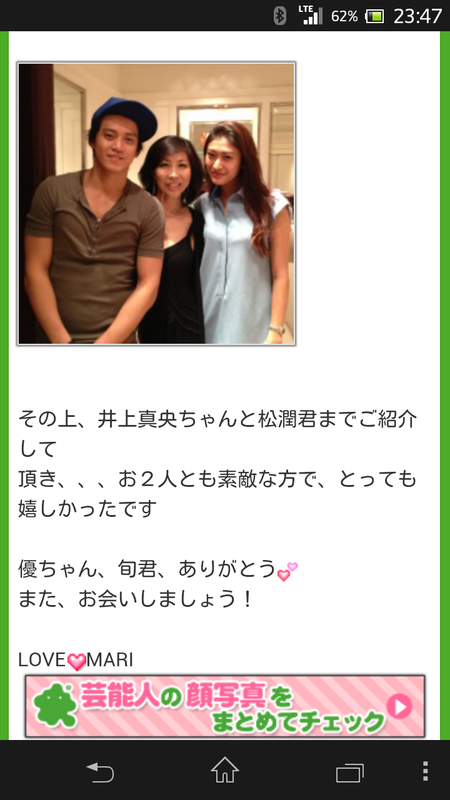 She writes about being introduced to Mao and Jun and the two of them being lovely people. If it was at a press event, there is a high probability of the presence of other celebrities that Shun and Yamada know and are good friends with, so why specifically these two? But whether they're really together or not, deleting the blog entry was probably not a clearly thought out idea as it just made things that much more suspicious. ... Enough with the rational already. she got me at futaritomo and brought me back to Ebisu. The gossip got big enough for them to get into the pages of Kyushu Sports on 17th August. I am fidgeting nervously since I read about this blog post and reporter. I normally don't bother about Shukan Josei but this hints is making me anxious and can't wait for next week. In one hand, I would be extremely happy if it's Maotsujun getting married. 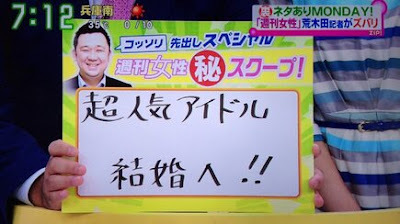 On another hand, I am nervous for Mao-chan and the effect this might be to her career. I got chiiills they're multiplying, and I'm loosing control, for the blogpost you're supplying, it's electrifying! Seriously though, if the rumoured soon-to-be-married couple happens to be maotsujun (which I don't think think it's probable but who knows?) we can be sure they would have thought about this a lot, and have taken into consideration all the possible pros/cons of the whole thing and have contingency plans, ne? Unlikely because December of last year (2012) Mao said she had a significant other who was a makeup artist. This was during her CM and/or work for PUMA (the sneaker brand). The quote: "I have filming on both the 24th and the 25th. I want to celebrate Christmas with the makeup artist who I'm close with, so I'm hoping that work will be done early."